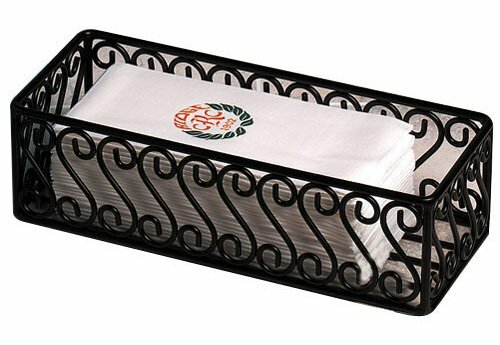 This rectangular wrought iron scroll basket can be used to display food like bread and baked goods, but it can also serve as a condiment caddy or organizational basket for accessories in the kitchen or bathroom. Wrought Iron construction makes this basket strong and durable, while the unique scroll pattern adds an attractive flair to a simple design. Ideal for home or commercial use. Can be used with or without a liner for sanitary or cleanliness reasons. Measures 12-inch length by 5-inch width by 3-inch height.